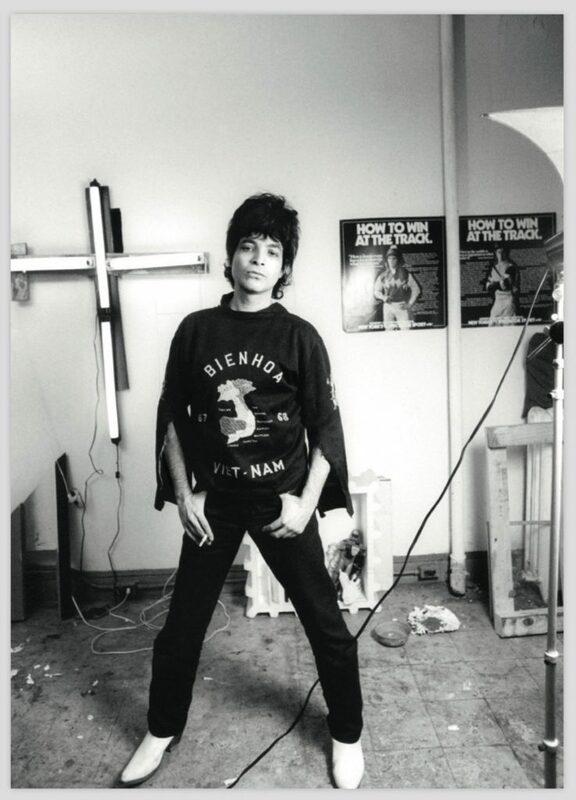 Keep IT Alive is an exhibition of Alan Vega’s final work, a suite of haunting large-scale paintings he had completed just before his death in July, 2016. The paintings, each composed of a central figure (often disfigured, deformed, or viewed askance) and presented against an obscured and chaotic backdrop, are an extension of the small-scale, serial pencil-and-paper portraiture that Vega produced nightly for over three decades. As paintings, they represent, too, a full-circle return for Vega who began his career as a painting student of Ad Reinhardt and Kurt Seligmann, then moved away from canvas towards sculpture and drawing and music, coming back to the medium, at the very end of his life, after working back through drawing and sculpture again. 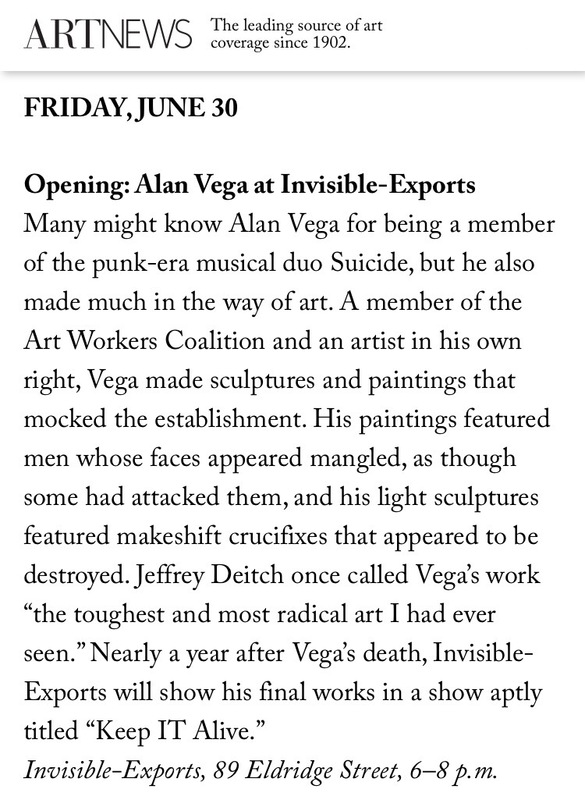 Born in Brooklyn in 1938, Vega is known first as one-half of the groundbreaking electro-punk duo Suicide, which initiated the merger of adversarial rock and anti-establishment performance that became punk, even as it left the movement behind. But music was always Vega’s second act. At Brooklyn College, he became involved with the activist collective Art Worker’s Coalition, which lobbied aggressively for museum reform and even barricaded MoMA, and with the Project of Living Artists, an anarcho-residency-performance space which emerged from it. He moved from painting to sculptures assembled from light fixtures and discarded electronic detritus, works which critic Simon Reynolds described “trash-culture shrines from a post-cataclysmic America of the near-future” and Jeffrey Deitch has called “the toughest and most radical art I had ever seen.” Vega staged several legendary shows at OK Harris Gallery, and later inaugurated Barbara Gladstone’s first downtown space in 1983. Through the 1980s and 1990s, Vega continued to make new work, but declined to exhibit it until 2002. 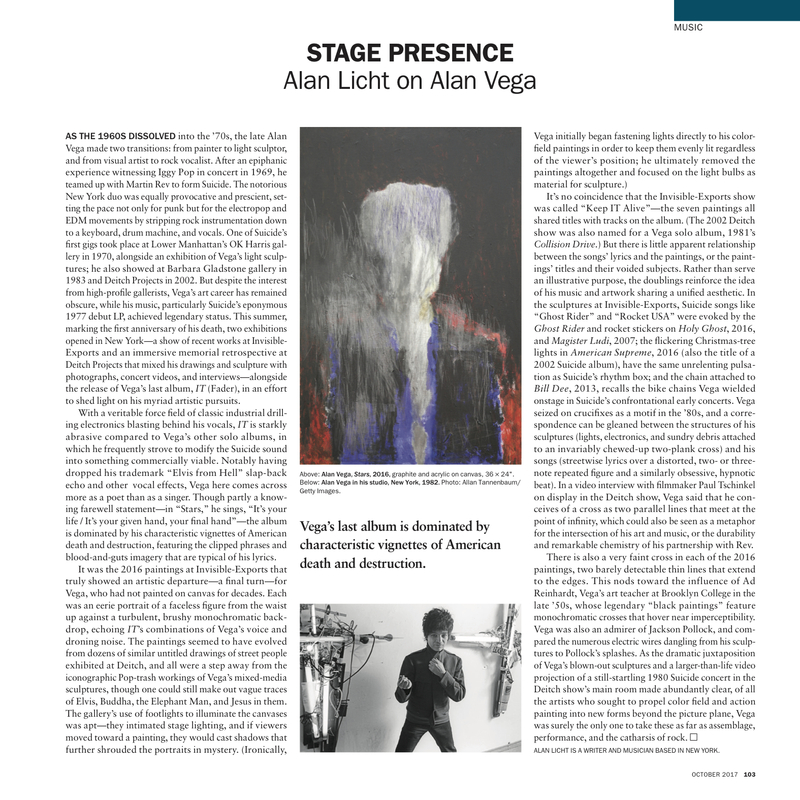 When Alan Vega’s death was announced by Henry Rollins in the summer of 2016, it seemed as if all of New York was in mourning. Outpourings of love were spray-painted on brick walls, record store sandwich boards cried out for an era lost, and music lovers and downtown doyennes recounted stories of a time that once was.